One of the main questions that must be answered when examining the practice of following a planting calendar and using cosmic rhythms to inform one’s cultivation activities is "Why?” What are we hoping to achieve, and why is that achievement important? While it is true that a knowledge and cooperation with cosmic forces can assist us in fostering healthy, vivacious food, medicine plants, and healing and strengthening of soils, in fact it is what happens as a result of the consumption and utilization of these plants that is the aspiration. 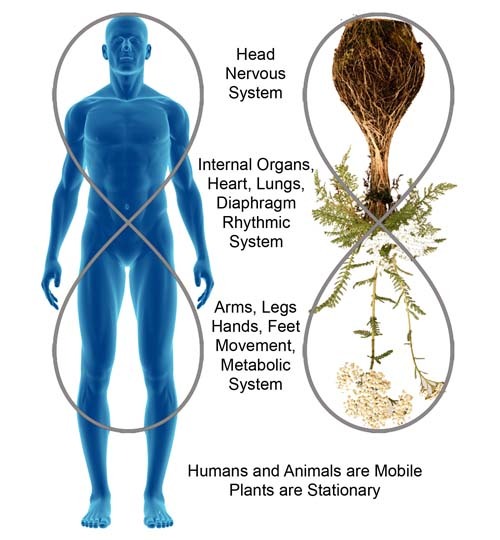 And in going one step further, the effect these plants have on those who use them is what Steiner was indicating when he linked his 1924 agriculture lectures to his much larger body of work concerning human health. Many years before, in his more prolific work with health, education and social/economic life, Steiner outlined the "threefoldness” of the human organism in his lectures. In this concept of threefoldness, the physical regions of the body and their functions are intricately linked with the psychological functions of the individual. Contemporary medical research has since revealed what Steiner knew, that body and mind are connected. This is the foundation with which one can see man’s fundamental relationship to the structure of the plant, and how each plant’s specific form reveals its action on the body. In the physical body, Steiner outlined three principal functional areas, each supporting a particular psychological activity. The nerve sense system is primarily centered in the nervous system. One can think about this location as being the head. This system supports thinking and perception. The rhythmic system includes the breathing and the circulatory system supports feeling. The rhythmic system can be depicted as located in the trunk. The motor-metabolic system includes the organs below the diaphragm and the limbs, and supports willing. This system can be pictured as being in the limbs and below the diaphragm. Now let us look at the structure of a plant as it is seen from the ground. It unfolds its roots in the soil, spreading out and investigating its surroundings. The plant develops the leaves from the stem, which transports water and nutrients around the plant, as well as performs respiration. The flowers and fruit, containing the seeds tend to form on the topmost portion. The reproductive organs are seen to orient themselves toward the sky. Thus the roots of the plant can be considered its nerves sense system, the stem and leaves as the rhythmic system, and the flower and reproductive portion as the motor-metabolic system. In this way, man appears like an inverse plant, with his nerve sense in relationship to the root-like portion, his rhythmic characteristic of the trunk corresponding to the stem and leaf, and the motor-metabolic system of his limbs and reproduction in relationship to the flower and fruit of the plant. We know that plants come in an amazing variety of forms and no two plants, even of the same species, are identical in shape or equal in development among the parts. In fact, when we see a plant that is disproportionately developed in one part or another, it gives us clues to the part of the human body that aspect of the plant might have a strong affinity for. For example, the fruits of apple trees, which are produced from their prolific flowers, have a slender stem and distant roots. This seems to indicate a strong inclination toward the motor-metabolic system in man. Let us remember that the motor-metabolic system is responsible for willing. What does this mean, in practical terms? An apple grown and tended using cosmic rhythms and an understanding of the forces behind the natural world will be able to manifest its most complete, vitality-filled "apple-ness”. It will contain the active substance that will assist the person who eats it in exercising their will. Likewise, a plant which expresses a strong leafy tendency corresponding to the human rhythmic system will work in such a way to strengthen the feeling part of man; his "heart”. This kind of specialization we see in plant forms today is in part a by-product of many of thousands of years of cultivation in order to make them more fitting for food production. The hand of the farmer and gardener encouraged a reciprocal bond from the plants he tended. Thus we have remained ever entwined. What we eat matters. Today it is more crucial than ever, as we tend our gardens and farms using planting calendars, compost preparations, homeopathy, and our own observation and intuition that we keep in mind this fundamental relationship between man and the plants. We use these tools passed down to us and rediscovered for us not only as ways to grow disease-resistant and beautiful produce, but also to imbue in what we grow the wholeness necessary to fill those who eat of it with what they need to develop, as Steiner said, "living connections of the microcosm to the macrocosm.1” Only with these rediscovered, renewed and strengthened connections can mankind progress from today’s confusion and calamity to balance, health, and peace. Our tasks as growers of food and medicine plants is so much more than making an income from the sale of food, however organically or biodynamically grown. As we plant our carrots and broccoli and yarrow, we also sow seeds of community. Our role is one akin to transformers of society, working through the deep-seated friendship between humans and plants. As our will acts through our hands, diving between the tender shoots, pulling away weeds or tucking fragile roots under the earth, we feel a love for our tender sprouts filling our hearts. This love fills our heads with a new way to see the world and others, in the harvesting and bringing of this food into homes, tables, and bodies. The farm and the garden becomes the center, the beginning and end of a cycle that starts with a seed. 2. Works Consulted: Schmidt, Gerhard. The Dynamics of Nutrition. Biodynamic Farming & Gardening Association, Rhode Island, 1980.